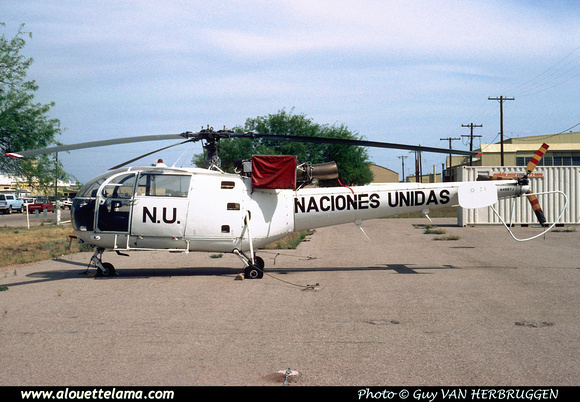 Life Flight UCSD; lsf Evergreen Helicopters Inc.
Evergreen Helicopters Inc.; seen at Marana, AZ, in white c/s with "N.U.-Naciones Unidas" tls. N4997J Eurocopter (Aérospatiale) SA316B Alouette III MSN 1316, Naciones Unidas (Evergreen Helicopters) - Marana, AZ - KMZJ - 09-1992 - Photo Guy Van Herbruggen. Dernière mise à jour/Last update : 02-03-2012. L'usage des logiciels Firefox ou Safari est recommandé. The use of Firefox or Safari browsers is recommended.